Baby Shower #2, O What a Beautiful Day! I am so blessed to have so many wonderful friends in this area. Six weeks ago, my mother-in-law’s friends threw me a couple’s shower, and last weekend, two of my good girlfriends threw me another baby shower that was more for people our age. It was a fall theme, and per my request, included NO silly games (thank goodness!). I only got a few pictures, but it was a beautiful day, full of good friends, delicious mimosas, and lots of great baby gifts. HFS, I have a room full of baby stuff! 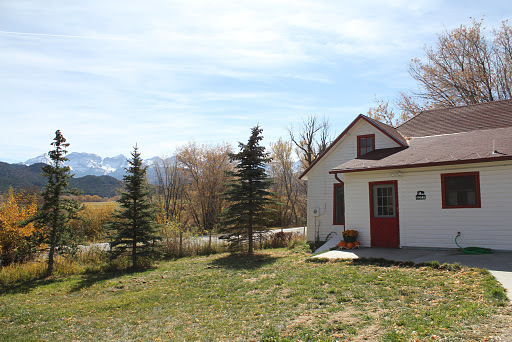 M’s cute little ranch house (her hubby works on a local ranch that provides housing). 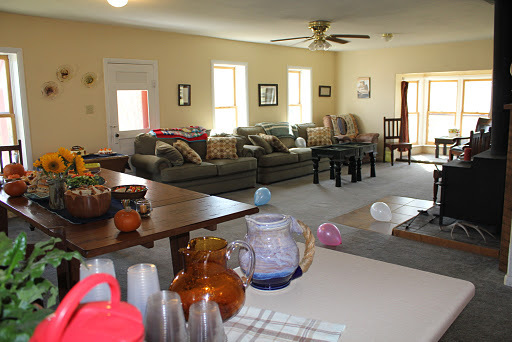 She had the perfect living/dining area for entertaining! Another friend of mine made the DELICIOUS cupcakes and cake. Beautiful, no?! 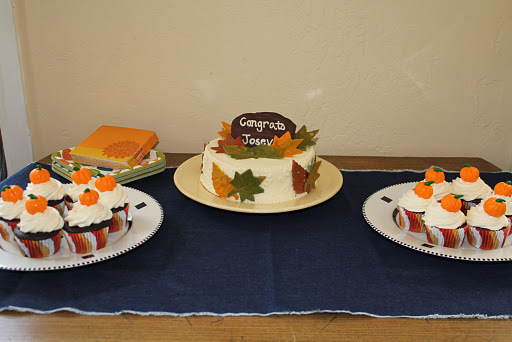 All of those leaves and pumpkins were edible frosting and fondant! Love these ladies. 🙂 The girlfriend on the right is 18w along with her first child as well (she’s the one I wrote about with the early m/c the same week of my BFP – she has severe endo issues). They threw a wonderful party, and they are both such kind-hearted, fun-loving women. Good, good friends. 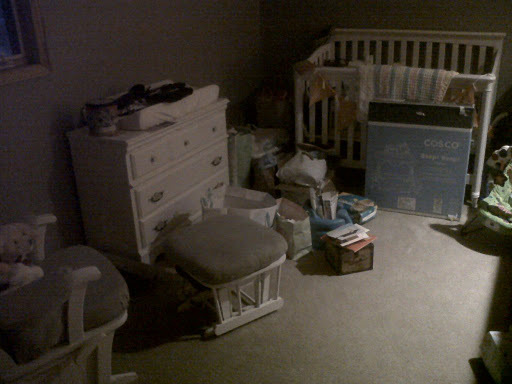 A dark cell phone pic of the loft this morning (the crib is piled full of stuff as well, as are the nearby closets). Yikes. Time to start organizing! 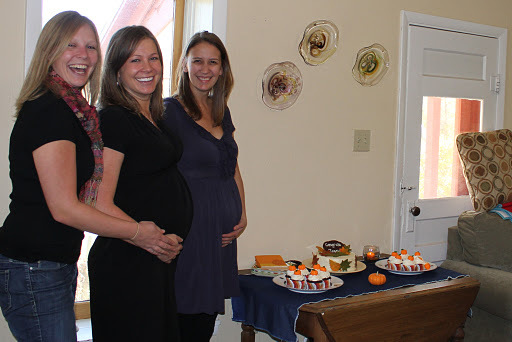 Also, I plan on doing a recap of the awesome virtual baby shower y’all threw me. I just need to get organized and take some pics of the different onesies that go with the different posts that were written. I’ll get on that asap!! The decorations and cakes and cupcakes were all beautiful! Sounds like you have some wonderful friends who threw an awesome shower. Time to get to work on that nursery, that'll be so much fun. Ah shoot, I just saw your comment on my last post – it was Walgreens! Oops! Your shower looks like it was great! What fabulous friends! 🙂 I see you got a glider…did you get the expensive one? I had the nursery totally done by 36 weeks which left me four long weeks of nothing to do. 🙂 Don't rush it. Man, I love the views where you live! Such an awesome shower. 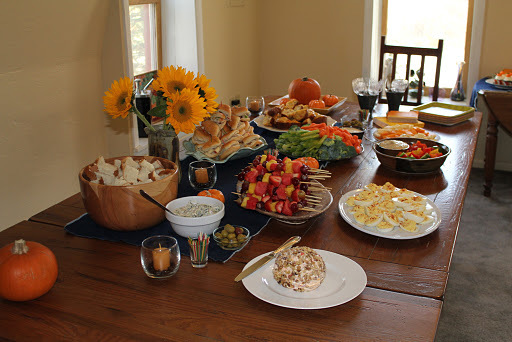 Love the fall theme…..love fall…mmm pumpkin. Dood! You have a baby room! Dood! You're having a baby! So exciting! 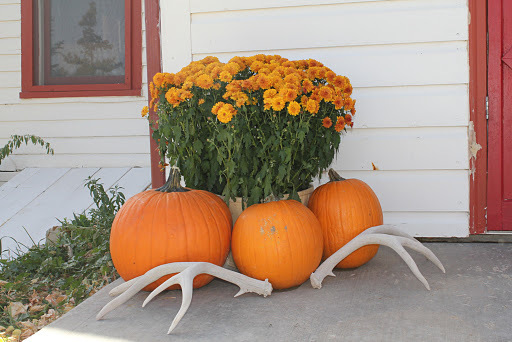 I do love me some fall decorations! The good news is that it looks like you have great friends. The bad news is that now I am freaking hungry after looking at these pics! 🙂 So glad you had such a great time. So cute! And a beautiful view. You are looking awesome!! You're a lucky girl…. 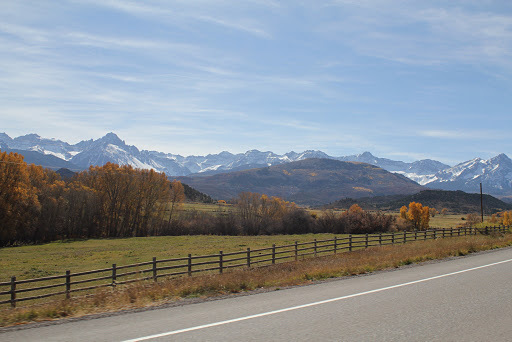 great friends and you live in an area of the country that is stunningly beautiful! Lucky girl! How fun and beautiful! Holy yum-yum's!! That food looks amazing! (I swear I'm not a 390 lb man.) Congrats on all the goodies!! You look beautiful!!!!!! ← A Birth Plan – Proactive or Irresponsible?